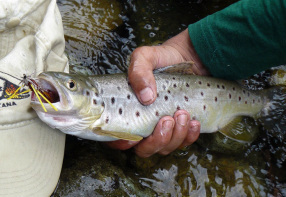 Fly anglers also are notorious for the dozens of different knots they use, many of which correlate with the type of fly line, leader and tippet they rely on. You also need good walking shoes (no waders) & earth color clothes. Only artificial wet flies like Peacock, March Brown, Butcher, Jungle Quill, Coachman, Royal Coachman, Woodcock & Green, Teal & Green, Silver Doctor, Thunder and lightening, Invicta, Muddlers, and Watson's Fancy are allowed. You can also use all sorts of dry flies and nymphs. Fly fishing is a mystery to many, an addiction to the rest.